Equilis StrepE is a vaccine which contains the active substance live deletion mutant Streptococcus equi bacteria. No adjuvant or preservative is included. Equilis StrepE is available as a lyophilisate (freeze-dried pellet) which is made up into a suspension for injection. The vaccine is provided together with the solvent, applicator and a syringe with needle. This is the first vaccine to be licensed for horses in the EU against strangles. What is Equilis StrepE used for? Equilis StrepE is used to vaccinate horses against the respiratory disease caused by the bacteria Streptococcus equi. The highly contagious and common disease caused by this bacterium is commonly called ‘strangles’. In strangles, the lymph nodes in the head can become large enough to block the airway, causing the horse to have difficulty breathing. This is a highly contagious disease and a common bacterial infection in horses. Equilis StrepE reduces the clinical signs of disease and the occurrence of lymph node abscesses (collections of pus). How does Equilis StrepE work? Equilis StrepE is a vaccine. Vaccines work by ‘teaching’ the immune system (the body’s natural defences) how to defend itself against diseases. Equilis StrepE contains small amounts of a type of bacterium called S. equi. When a horse is given the vaccine, the immune system recognises the bacteria as ‘foreign’ and makes antibodies against them. In the future, the immune system will be able to produce antibodies more quickly when it is again exposed to the bacteria. The bacterium strain included in Equilis StrepE has had some genes removed, so that it grows less well inside the horse’s body and is less likely to cause disease. This makes it suitable for use in a vaccine. How has Equilis StrepE been studied? The vaccine is given as a 0.2-ml injection into the inside of the upper lip. The effectiveness of Equilis StrepE has been studied in safety studies and one main field study. The horses had not had any disease including strangles in the past and had never been vaccinated. The results of the safety trials demonstrate that Equilis StrepE is safe for horses from four months of age onwards, as the local and systemic reactions observed after single, repeated dose and overdose treatment were considered acceptable. Horses from four months of age should receive a second injection after four weeks. All horses should be revaccinated every three months to maintain immunity. Equilis StrepE is only for use in healthy horses that are at risk of S. equi infection due to contact with horses from areas where the bacterium is known to be present. What benefit has Equilis StrepE shown during the studies? The studies demonstrated that Equilis StrepE is effective in the active immunisation of horses from 4 months of age against Streptococcus equi to reduce clinical signs and occurrence of lymph node abscesses. Fewer of the horses receiving Equilis StrepE had symptoms of strangles. They also had fewer abscesses and fewer lymph nodes affected. What is the risk associated with Equilis StrepE? Only healthy horses which are at risk of infection should be vaccinated. After injection, swelling will develop at the injection site within four hours and the injection site may become warm or painful. The reaction is greatest at two to three days after injection, but the area affected should not be larger than 3 by 8 cm. The swelling should disappear within three weeks and should have no effect on the horse’s appetite, nor cause it any discomfort. In very rare case an abscess and discharge may develop at the injection site, and the lymph nodes in the head may enlarge, which may be painful for a short while. An increase in body temperature of up to 2°C may occur on the day of vaccination. In rare cases, loss of appetite, fever and shivering may be observed. In very rare cases depression may develop. In case of accidental self-injection, which can cause inflammation with severe pain and swelling, seek medical advice immediately and show the Package Leaflet or the label to the doctor, even if only a small amount has been injected. The withdrawal period is zero days. Why has Equilis StrepE been approved? The Committee for Medicinal Products for Veterinary Use (CVMP) concluded that the benefits of Equilis StrepE exceed the risks for immunisation of horses against S. equi to reduce clinical signs and occurrence of lymph node abscesses, and recommended that Equilis StrepE be given a marketing authorisation. The benefit-risk balance may be found in module 6 of this EPAR. The European Commission granted a marketing authorisation valid throughout the European Union for Equilis StrepE to Intervet International B.V. on 7 May 2004. Information on the prescription status of this product may be found on the label/outer package. INN or common name: Live vaccine against Streptococcus equi. Onset of immunity : The onset of immunity is established as 2 weeks after basic vaccination. Duration of immunity : The duration of immunity is up to 3 months . have livery horses from such areas. haemorrhagica is very low, its occurrence cannot be ruled out completely. until basic vaccination has been completed. 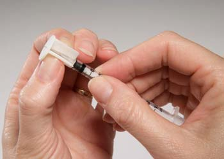 Special care must be taken when connecting the applicator to the needle to avoid needle-stick injuries. the label to the physician. tissue. Accidental self injection may result in an inflammatory reaction with severe pain and swelling. amount is injected and take the package insert with you. reaction with intense and painful swelling after accidental injection. discharge commonly occurs from the mucosal injection site at 3 or 4 days post vaccination. injection site or in the regional lymph nodes. inappetance, fever and shivering may be observed. In very rare cases depression may develop. Limited information is available on the safety and efficacy from the use of this vaccine with any other. 0.3 ml of the sterile solvent provided. Do NOT shake and wait 1 minute after addition of the solvent. contents of the syringe into the inside of the upper lip (see Figure 3). dose of vaccine is needed to restore immunity. occasionally be observed one day after vaccination. To stimulate immunity against Streptococcus equi . disseminate systemically at the recommended dose. quarter of horses vaccinated with the recommended dose. Lyophilisate and solvent: 18 months. Reconstituted vaccine should be used within 4 hours. Solvent: This medicinal product does not require any special storage conditions. aluminium cap, 10 applicators, 10 syringes with needle. approved for use by the competent authorities. After reconstitution administer 0.2 ml submucosally to the inside of the upper lip. Reconstituted vials should be used within 4 hours. 13. THE WORDS "FOR ANIMAL TREATMENT ONLY"
14. THE WORDS "KEEP OUT OF THE REACH AND SIGHT OF CHILDREN"
for use by the competent authorities. THE WORDS "FOR ANIMAL TREATMENT ONLY"
THE WORDS "KEEP OUT OF THE REACH AND SIGHT OF CHILDREN"
Submucosal vaccination of 0.2 ml of reconstituted product. Revaccination: Revaccinate every three months to maintain immunity. the upper lip and insert the needle into the inside of the upper lip until the applicator rests on the lip. 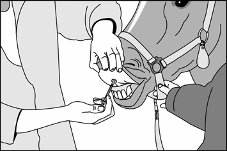 Administer the whole contents of the syringe into the inside of the upper lip (see Figure 3). The vaccine strain is sensitive to penicillins, tetracyclins, macrolides and lincomycin. strain to antibiotics is listed above. dissiminate systemically at the recommended dose. incidence of purpura haemorrhagica is very low, its occurrence cannot be ruled out completely.